It’s amazing what heavy equipment can do. This weekend the excavator arrived, and the alders met their match. Don’t get me wrong: remnants of their roots are still lurking beneath the surface, so I know the war is not over. But I do feel like we’ve won round one of the battle. We plan to seed with native blue wheat grass, wild daisies, and lupine. “Au naturel,” Clark calls it. 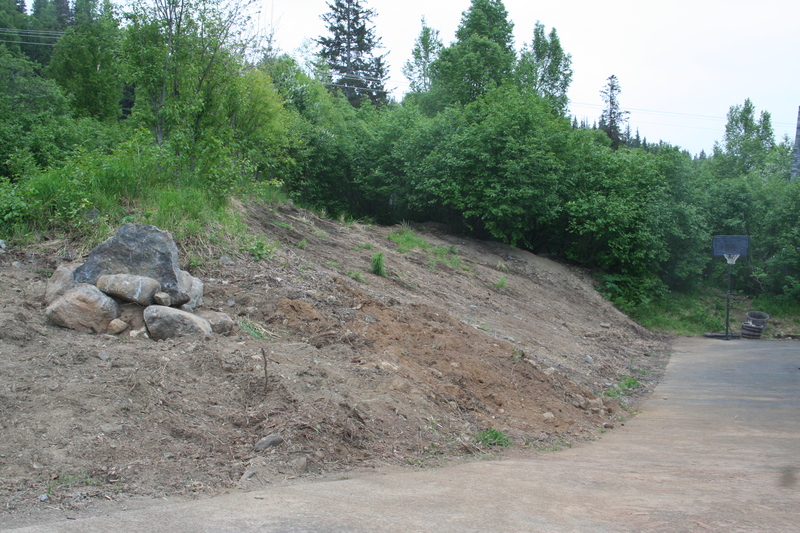 We also have a plan for those enormous rocks we placed out front, but that’s a ways out. Stay tuned! Now let’s head out back, where the journey was far more overwhelming. 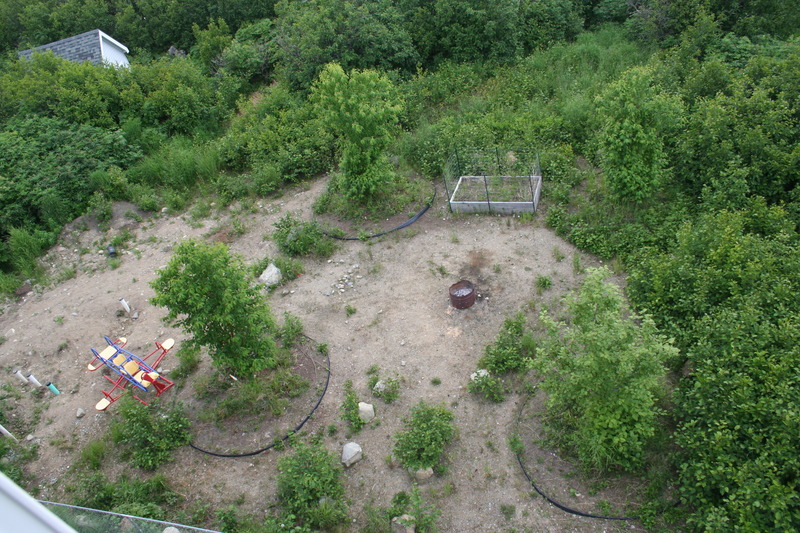 Alders galore, a raised bed garden smack dab in the middle of the lot, four trees flanking a burn barrel, and giant boulders scattered throughout the uneven terrain. Could we really transform this? Not quite after, but definitely progress! Hooray for a blank slate! 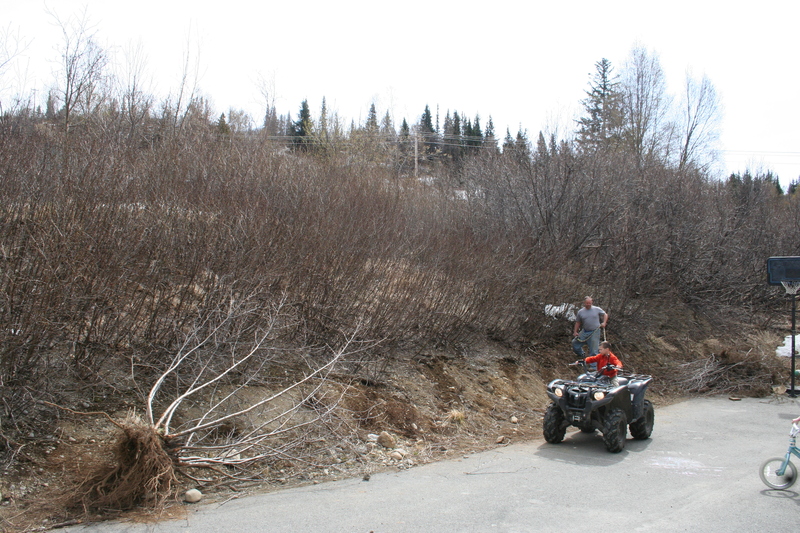 We kept a perimeter of alders as a natural buffer between the neighbors, but the rest is cleared, open, and leveled. That pile of brush in the middle of the yard will be part of our ninth and final trailer load to the wood lot. Slashing, cutting, digging, pulling, hauling, loading. It has been a miserable weekend of manual labor. I’ve decided we should have rented this bad boy a month ago – what an amazing machine! John Deere is the new love of my life. This guy (with his brute strength and my husband’s CDL skills) accomplished more in 8 hours than we accomplished in three snarky weekends. Ripping, pulling, leveling, hauling. JD has quite the tongue! 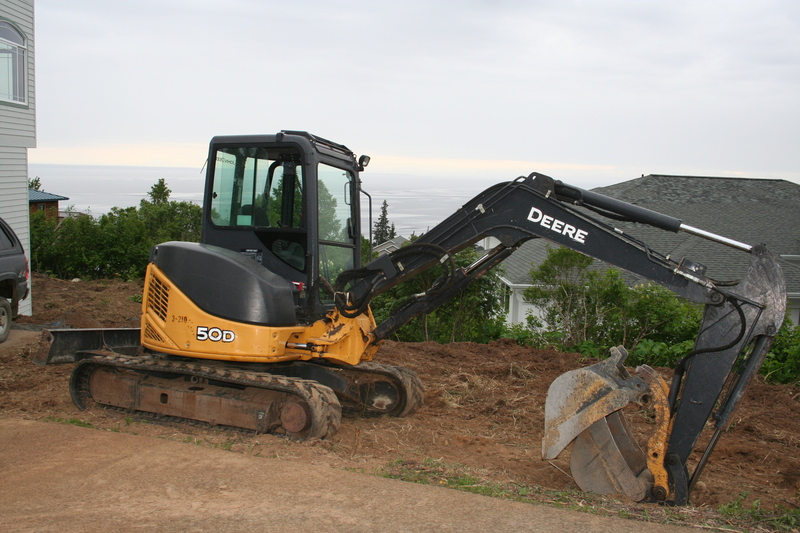 Our love story with heavy equipment shall continue when a Bobcat arrives. Clark will use it for leveling and hauling topsoil. Then it will be time to seed, which means babysitting the sprinkler for a few weeks. The kids and I leave for Nebraska in two days, so I don’t get to keep close tabs on the future progress. Or help. 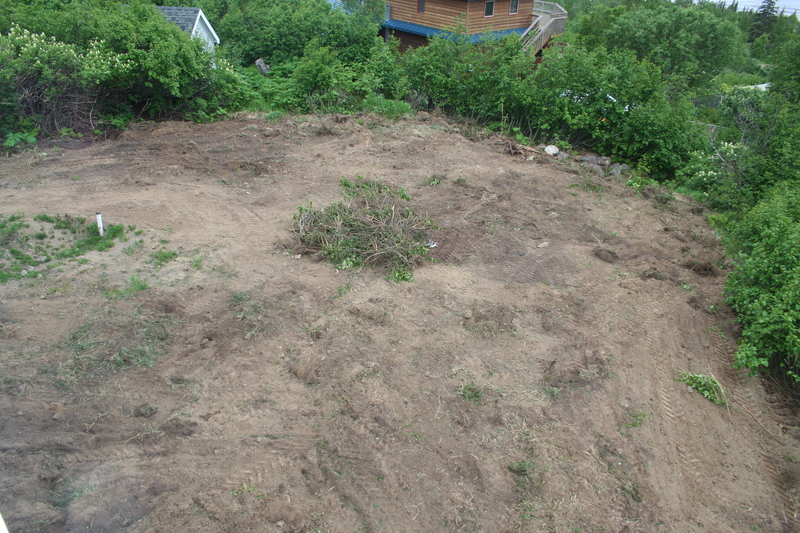 At least the manual labor is nearly complete, which is good because those alders put up a good fight. We are both full of scrapes from our arm pits to our wrists, along with several other hodge podge bruises. Despite our slash marks, Clark is proud to have survived the weekend without any poked eyes, flipped excavators, or severed gas lines. On a vain note, I’m in a wedding in a few weeks. Hopefully my arm gashes heal quickly and I can even out the farmer tan that extends from the end of my short sleeves to the top of my gloves. How attractive. Spray tan, maybe? 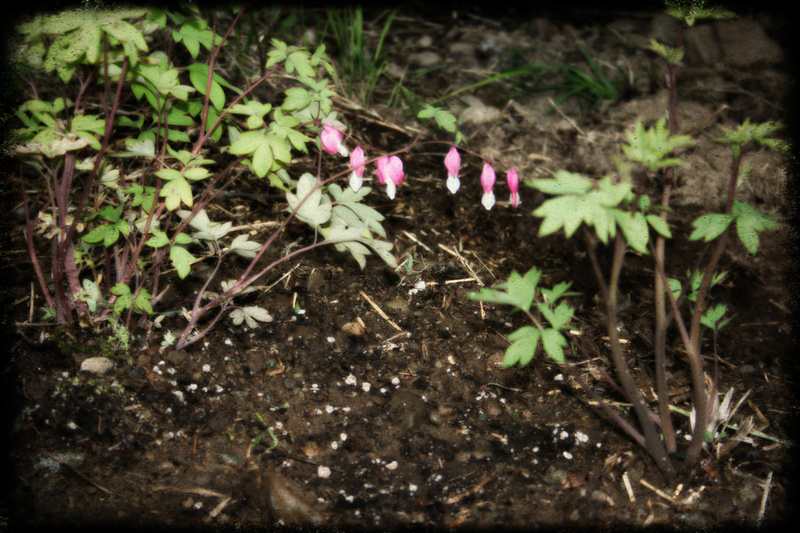 The perennial was a gift from our friends Brandon and Keri, who also lost a special dog in the past week. Last Wednesday we showed up on their doorstop, unannounced, offering a small token of sympathy and sharing tears with them. By Saturday they were at our home, reciprocating the generosity. Crazy timing. We’ve been enveloped in generosity this weekend. The phone calls, cards, emails, flowers, and visits have been so appreciated and helpful. The landscaping work also kept our minds preoccupied. We were beyond fragile on the day we said goodbye to Bailey. The next morning was still pretty bad. Clark got up first, and the smell of his breakfast lulled me downstairs. The kids slept in as we sat together at the kitchen island, somberly chewing and looking out at her grave. We weren’t yet able to talk about her without tears, and we both felt haunted at the final image of her in the ground. But as we headed outside to tackle the landscaping project, we worked as a team much better than we had in the previous weeks. Perhaps we were more sensitive to each other because we shared a common grief. No doubt about it… Bailey’s loss has firmly added another brick to the wall of our marriage history. It’s now been three days since Bailey has been gone. We aren’t crying as much, but we wonder if there will ever be a day when we don’t think about her. She would have loved this yard.